There is often an insightful story hidden in the data which will tells you how you are operating the business, and the objective of data analysis is to find that story. This report reviews how ScottMadden has helped utilities get the most reliability for the dollar using a five-step process. A new proceeding in NY explores the role electric utilities can play in encouraging greater adoption of electric vehicles. Dive into the key details and implications in this Clean Tech & Sustainability Minute. ScottMadden explores the creation of the Alliance for Transportation Electrification (ATE) for rapid transportation electrification adoption in this VIU Minute. From an innovative, and controversial, performance-based energy price scheme to transactive energy projects and flexibility markets, this article (attached and below) focuses on what has worked and what hasn’t. The complete article can be found here. When a taxi driver offers a stock tip, it usually means that it is time to sell. When the taxi driver brings up climate policy, you wonder how the issue became taxi cab parlance. We have just arrived in London, and the taxi driver is lamenting the city’s redesign of roads. What were previously lanes for vehicles now form a network of bike superhighways. According to our driver, the changes have narrowed roadways, slowed commutes, and increased traffic. He notes it is all part of the United Kingdom’s effort to reduce greenhouse gas emissions. Turns out the “Cycle Superhighways” were conceived and pushed by Boris Johnson, the former mayor and an avid cyclist. The vision is that getting more people on bikes will reduce congestion for vehicles. In fact, the current target is for 80 percent of trips taken in the city to be accomplished by cycling, walking, or public transportation by 2041. Despite some inaccuracies and hyperbole, it is striking to listen to the taxi driver discuss the United Kingdom’s ambitious desires to address climate change. 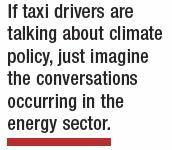 If taxi drivers are talking about climate policy, just imagine the conversations occurring in the energy sector. This was a positive start to SEPA’s fact-finding mission to the United Kingdom that included 25 utility and energy executives from the United States. 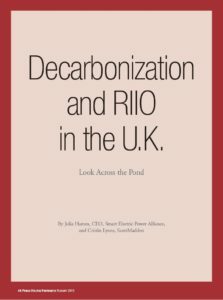 With the United Kingdom serving as a poster child for business model reform, we wanted to better understand the country’s decarbonization efforts and the highly touted performance-based regulatory mechanism known as RIIO. Similar to previous fact-finding missions to Europe, it did not take long to realize the taxi driver foreshadowed the importance of climate policy in the United Kingdom. We discovered carbon policy to be a critical underpinning to the U.K. energy markets. The country is working toward several international greenhouse gas reduction commitments, including Kyoto protocol targets and participation in the European Union Emissions Trading System (EU ETS). As the world’s first major carbon market, the EU ETS is a cap-and-trade system reducing emissions from heavy energy producing or using industries, such as power stations and industrial plants. Even more important than the international efforts is the United Kingdom’s domestic policy. Long-term, legally binding domestic targets were enacted into law with the passage of the Climate Change Act 2008. The legislation requires the government to reduce greenhouse gases by at least 80 percent below 1990 levels by 2050. By mandating the reduction into law, the effort to reduce greenhouse gas emissions is insulated from the whims of the current government or prime minister. In addition, the decarbonization effort cannot be ignored as the government must submit carbon budgets that act as stepping stones toward the 2050 target. Carbon budgets cap the amount of greenhouse gases emitted over the five-year period. To guide policy makers, a carbon budget must be set at least 12 years in advance. The fifth and most recent carbon budget requires the United Kingdom to reduce greenhouse gases by 57 percent from 1990 levels during 2028-32 (see table). We found that these climate policies serve as a foundational driver for the energy industry. They provide a clear path forward with a high degree of certainty. Policy makers, utilities, and third-party service providers are all working with a unified focus on a clear desired outcome. The next challenge is to determine how to move forward. The current electricity market in the United Kingdom consists of more than 100 generation firms, three transmission network operators (TNOs), 14 distribution network operators (DNOs), and 72 active energy suppliers. The market structure can trace its roots back to deregulation and privatization in the late 1980s. After some time, the Office of Gas and Electricity Markets (Ofgem) began regulating the network operators with a revenue-cap framework called RPI-X. In 2008, Ofgem undertook a comprehensive review of the RPI-X framework. The multi-year assessment concluded consumers had benefited from effective regulation alongside competitive markets, but the framework would not sufficiently encourage or reward networks for taking a leading role in a decarbonized energy sector. To build a network capable of addressing climate change, the utilities would need to take risks, be innovative, and focus on customers. A new model was proposed “to drive smarter and more sustainable networks to deliver a secure and low-carbon energy sector and long-term value for money for consumers.” The performance-based regulatory model adopted by Ofgem sets Revenue using Incentives to deliver Innovation and Outputs (“RIIO”). At its core, RIIO provides a comprehensive approach to reward TNOs and DNOs for innovation and delivering desired outcomes. Now any conversation related to performance-based regulation invariably cites RIIO as a prime example. Multi-Year Rate Plan: RIIO consists of eight-year rate periods with baseline revenue set by Ofgem. The time period is intended to incentivize long-term investments. In addition, efficient utility operations are incentivized as a portion of cost-savings/cost-overruns are shared with or borne by the utility. Revenue adjustments may occur based on utility performance against targets or through an uncertainty adjustment mechanism for unpredictable cost changes or events. Totex: A portion of capital expenditures (capex) and operating expenditures (opex) can be placed in a regulatory asset allowing a rate of return. When coupled with the revenue cap noted above, the totex approach removes the utility preference for capex and should encourage the most cost-effective solution. This is the case, even if the solution is opex and provided by a third-party vendor. 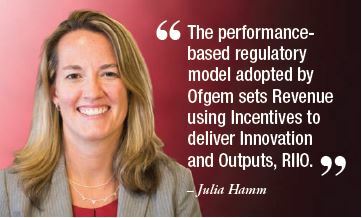 Performance Incentives: Ofgem set specific targets for utilities that may impact financial performance up to +/- 250 basis points on return on regulatory equity. The six target categories include reliability and availability; environment; connections; customer service; social obligation; and safety. Utility benchmarks and scorecards are also published. Innovation Fund: A source of funds to sponsor innovative pilots that test new technologies and operating and commercial arrangements. A key objective of the fund is to share lessons learned about modernizing the grid. We were eager to learn how the grand experiment in performance-based regulation was working now that it is roughly halfway through the first multi-year rate period. Could this regulatory model spur innovative utility investments, support customer needs, and drive deep decarbonization? In addition, what challenges must be overcome to ensure success? RIIO is performing mostly as expected even though it is still early for a full evaluation. The network operators have met most of the performance targets. In addition, most network operators are underspending compared to expenditure allowances. As a result, companies are currently forecast to earn above the cost of equity. Despite the progress, we also found many of the same challenges facing electric utilities in the United States. In particular, we saw how the growth of distributed energy resources and non-wire alternatives was creating issues related to reliability and the obligation to serve. As part of a “Smart Systems and Flexibility Plan,” DNOs have had to open up their network to alternative “flexible” solutions that provide revenue opportunities for non-traditional network solutions, such as storage, DSR, and energy efficiency. While these plans are driving non-wire alternatives on the system, the DNOs need to continue to plan for the same levels of reliability. Given the unproven nature of these new technologies and risks to system performance and reliability, the conservative nature of utilities may drive redundancy in the solutions deployed. Until the framework expands to include some type of performance obligation for third parties operating grid assets, the concept may continue to struggle. At present, reliability and obligation to serve are left to the DNOs, even as complexity on the grid increases with the growing number of distributed energy resources. The unifying driver in the United Kingdom is a clear climate policy with explicit milestones on the path toward a 2050 target. Meanwhile, a common grievance in the United States is the lack of a coordinated and comprehensive federal energy policy. This stark difference between the United Kingdom and United States was evident throughout the trip. However, in the closing days of the program, participants argued parallels do exist—just not at the federal level. Several U.S. states driving energy transitions appear similar to the environment present in the United Kingdom. The most obvious example is the climate policy of California. In June 2005, Governor Schwarzenegger signed an executive order requiring the state to reduce greenhouse gas emissions levels to a level 80 percent below 1990 levels by 2050. The Global Warming Solutions Act of 2006 was passed to provide the California Air Resources Board the authority to implement the measure. The multitude of actions taken by California in the decade since have been underpinned by this commitment to greenhouse gas reduction. The clear, long-term direction in Illinois has created an environment for ComEd to develop a vision of the future where the utility serves as a network or platform that allows customers to plug in and engage in energy services. The utility is now evaluating the capabilities needed, infrastructure required, and cost and value to customers. With this strong focus on clean energy deployment (and large-scale renewables), the state has not placed a strong focus on upgrading physical infrastructure (e.g., grid modernization) and changing the utility business model. Bolstered by these stateside examples, the key lesson from the United Kingdom is clear: major transitions in the energy industry require a focal point to drive innovation and change. In the case of the United Kingdom, climate change policy functions as the driver. It enables stakeholders in the electric industry to conduct goal-setting and long-term planning. Stakeholders can work on different priorities, but everyone is moving in the same direction. It is also important to note the focal point does not need to be climate policy. Illinois outlined a path toward grid modernization while Massachusetts focused on the implementation of clean energy resources. This focal point is driving utility innovation and direction. In the absence of a focal point, stakeholders are left merely with standalone initiatives. Further, prudently allocating resources becomes challenging because there is no metric for comparison and evaluation. The United Kingdom has a clear commitment and path toward decarbonization. Yet the implementation of RIIO has not been without challenges similar to the ones found in the United States. However, if U.K. stakeholders are successful in resolving the lingering issues, taxi drivers in London may be talking about TNOs, DNOs, or even NWAs in the near future. Advanced Energy Economy Institute, America’s Power Plan, and Rocky Mountain Institute. Navigating Utility Business Model Reform: UK’s RIIO – A Performance-Based Framework for Driving Innovation and Delivering Value. November 2018.